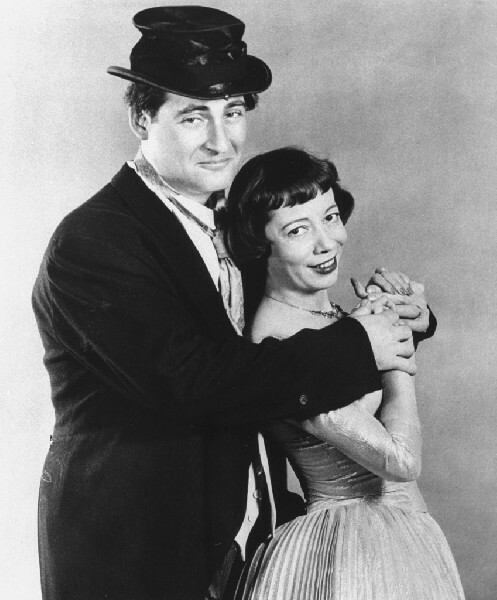 The classic comedy pair Sid Cesar and Imogene Coca. A skit from their variety show. 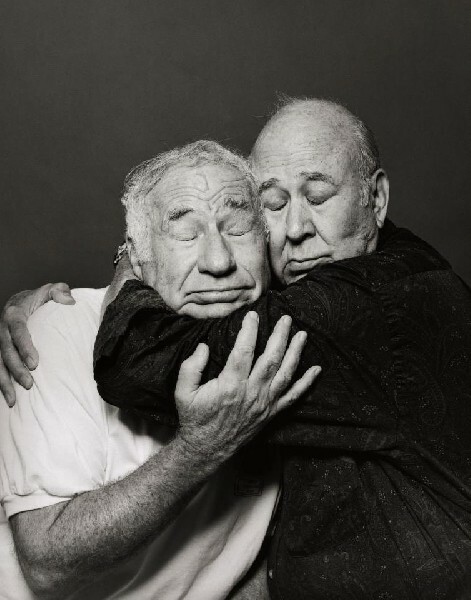 Collaborators Mel Brooks and Carl Reiner embrace. Reiner hugs Sid and Imogene. 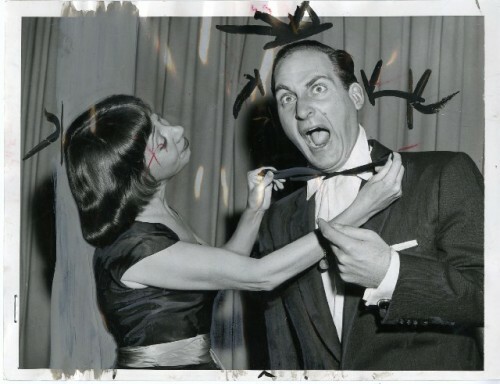 In the early years of television, in the 1950s, the Golden Age of Comedy, when Comedy Was King, hands down Sid Caesar, star and inspiration of the weekly, Saturday night variety series, Your Show of Shows, was the King of Comedy. If Caesar, so aptly named, ruled the realm of comedy he was surrounded with a royal court of subsequently legendary collaborators and writers. None among them were more essential than his magnificently gifted and hilarious co star Imogene Coca (November 18, 1908 – June 2, 2001). While they worked together from dawn to dusk six days a week for years they never dated or even socialized. It was strictly a working relationship. From 1950 to 1954 they owned Saturday night. It laid the foundation for Saturday Night Live which premiered on October 11, 1975. 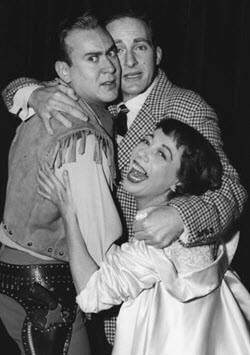 Largely based on the skit and topical format of Show of Shows it owes much to the legacy of Sid Caesar. On Wednesday, when Caesar passed away at 91, he was a footnote of early television and a complete unknown to the Twitter and Facebook generation. There are uncanny parallels to the recent demise of the mid-career actor, Phillip Seymour Hoffman. After four grueling years Caesar was famous and wealthy when the network cancelled the show. The partnership with Coca ended while he remained on the air until 1958 in Caesar’s Hour and the Sid Caesar Show. Coca was given her own show. When that failed they were reunited but it lacked the original spark and ratings declined. That sent Caesar into a decades long tailspin of booze and barbiturates. From which he eventually recovered with a strict regimen of sobriety, diet and exercise. Although he hit rock bottom Caesar managed to rebound but never regained the dominance of his early career. Like so many the pressure to produce for years on end resulting in fame and fortune left him riddled with self loathing and doubt when it all evaporated. Perhaps even greater than his artistic accomplishments is the chronicle of getting his life back together. For that alone he should best be remembered. What a magnificent triumph to die with his comic boots on at 91. Up yours Mr. Grim Reaper. On Saturday nights my family gathered around our single TV falling on the floor laughing at the latest skits and gags of Your Show of Shows. Some of those classic routines and characters have been compared to the best of Charlie Chaplin and Buster Keaton. He was that good. In addition to Coca there were also Carl Reiner and the amazingly versatile, diminutive Howard Morris. Who will ever forget Morris assisting to dress Caesar as an ersatz general. Sid was masterful at inventing language in this case a Germanic dialect accompanied by all manner of hilarious paramilitary gestures. It was such a wonderful take down of the abuse of power and its delusions. Of course Caesar had a lot of help. His writers were a who’s who of comedy including Carl Reiner, Neil Simon and his brother Danny, Woody Allen, Larry Gelbart and Mel Brooks. Like many stars Caesar had a huge ego and scathing rage. There is a tale of his dangling Mel Brooks from an 18 story window. Surely that wasn’t very funny. When a horse threw his wife he knocked the steed cold with a punch to the head. Brooks used it as a gag in his film Blazing Saddles. While Caesar reigned supreme there was a lot of competition. In the early years only a fraction of Americans owned televisions. For those that did there wasn’t much programming and only a few networks. Much of the day the stations ran test patterns. That started to change in 1948 when Milton Berle launched Texaco Star Theatre which lasted until 1955. Back then we actually watched the ads like those gas station guys who promised to pump the gas, check the oil and wipe the windshield. Nobody does that anymore. Or remember the dancing Old Gold cigarette pack? She had a smaller partner in the dancing book of matches. People began to buy TVs to watch Uncle Milty even though programming ended for the night when he signed off. It took some time before the debut of late night news. Americans started to stay up late with the launch of The Tonight Show. Leaving CBS, Steve Allen created a late-night New York talk-variety TV program in 1953 for what is now WNBC-TV. The following year, on September 27, 1954, the show went on the full NBC network as The Tonight Show, with fellow radio personality Gene Rayburn (who later went on to host hit game shows such as Match Game, 1962–1982) as the original announcer. The show ran from 11:15 pm to 1:00 am on the East Coast. Jackie Gleason, a rival of Caesar, was working at Slapsy Maxie's when he was hired to host DuMont's Cavalcade of Stars variety hour in 1950. The program initially had rotating hosts; the offer first made to Gleason was for two weeks at $750 per week. When he said he did not consider that worth the train trip to New York, the offer was extended to four weeks. CBS wooed (and won) him over to its network in 1952. Jack Benny made his TV debut in 1949. He was among those making a transition from radio to television. The Jack Benny Program was telecast on CBS from October 28, 1950, to September 15, 1964, and on NBC from September 25, 1964, to September 10, 1965. 343 episodes were produced. In the 1950s comedy shows came and went. Uniquely, I Love Lucy lasted from 1951-1957. The Burns and Allen Show debuted in 1950 with the famous closing line “Say goodnight Gracie.” The Victor Borge Show faltered as did those of the genius Ernie Kovacs. With the ever fickle ratings The Donald O’Connor Show, The Doodles Weaver Show, The Spike Jones Show, The Ford Festival and Sound Off Time came and went. We fondly remember Eddie Cantor, Red Skelton, Jimmy Durante, Wally Cox, Jonathan Winters, Art Carney, Groucho Marx, Phil Silvers, Eve Arden, George Gobel, Beulah, The Goldbergs, Dean Martin and Jerry Lewis, Bud Abbott and Lou Costello, Danny Thomas, Fred Allen, Ed Wynn, and others of that gilded era. As well as those we have forgotten. There is about to be a changing of the guard for the Tonight Show ushering in Jimmy Fallon following the Olympics. After all that snow we are going to need a few laughs. The lineage of hosts includes Steve Allen (1954–57), Jack Paar (1957–62), Johnny Carson (1962–92), Jay Leno (1992–2009, 2010–14), and Conan O'Brien (2009–10). Several guest hosts also appeared, particularly during the Paar and Carson eras. When perennial guest Joan Rivers had the chutzpah to star in her own show Carson never again spoke to her. The new host of The Tonight Show is a former Late Night host and Saturday Night Live star. From then until so many have made us laugh. 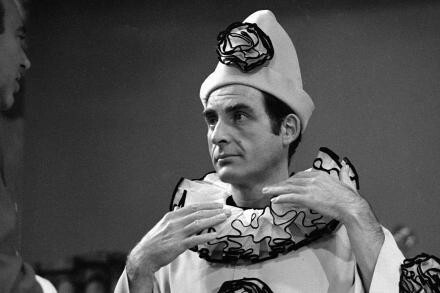 With the passing of Sid Caesar, however, the King is Dead and Long Live the King. Someone today may be as good but none will ever be better. "i wonder if Frank Stella was infleunced by the test patterns? I do remember all those programs, Caesar and the troupe of players, wild, live, breaking up and riffing without a lot of control. But it worked to reveal the pompous, the myopic and the vain in all of us! "